When Dave leaves the radio studio and enters the recording studio, he puts on a different hat and relies on a different set of tools. Waves’ equalizers, effects, metering tools and tape saturation plugins form the basis of the Dave Clarke sound and of the pumping techno trails heard on remixes for the likes of Depeche Mode, The Chemical Brothers, John Foxx, I am Kloot, and Louisahhh!!! & Maelstrom, to name just a few from his 25-year career. 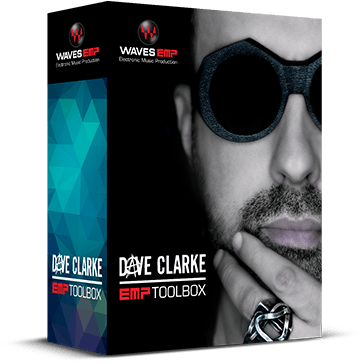 Chosen exclusively by Dave himself, the Dave Clarke EMP Toolbox contains seven of these supreme sound-crafting processors – the ones he uses regularly in his mixing and mastering sessions. With this collection of plugins, electronic music producers of any style will find what they need to give their mixes a professional lift. And if techno or electro is your trade, you are sure to find inspiration in this hand-picked suite. * Dave Clarke also uses the SSL 4000 Collection.